Sr Ekaloa Rita Mefaramu is confident the course will enable her to better implement health policies and achieve better outcomes in Gulf Province. 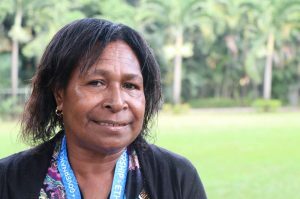 More than 70 public servants from throughout Papua New Guinea have boosted their speechmaking and speech writing abilities, key skills for public sector leaders who can inspire, motivate and improve service delivery. The Pacific Leadership and Governance Precinct’s Public Speaking and Speech Writing course was held last month in Port Moresby and Vanimo, and included participants from central and provincial government agencies. Sr Ekaloa Rita Mefaramu, Public and Rural Health Extension Services Coordinator at Kerema Hospital in Gulf Province, said the course advanced her skills and confidence. “We’re able to speak with confidence to the public and tell them the importance of the policies that are in place,” she said. “When I return back to my province I know that I can speak without fear and without hesitation. Ivan Kila, Principle Strategy Officer at the Department of Treasury, said public speaking and speech writing are crucial components of his role. “For the Treasury Department the vision is to bring services down to the most remote areas. The course was led by Australian public relations expert Toby Ralph, and supported by PNG Toastmasters Division Director Monica Toisenegila and by University of Papua New Guinea law lecturer Tapora Isorua. Teaching was centred on advanced communication skills in public relations and media management, and presenting information clearly in both oral and written form. The course also focused on knowing one’s audience, writing persuasively, and communicating with influence to convey critical information and motivate action. The Pacific Leadership and Governance Precinct is a partnership between Papua New Guinea and Australia that contributes to the development of public sector leaders who are ethical, capable and can deliver improved services for their communities.